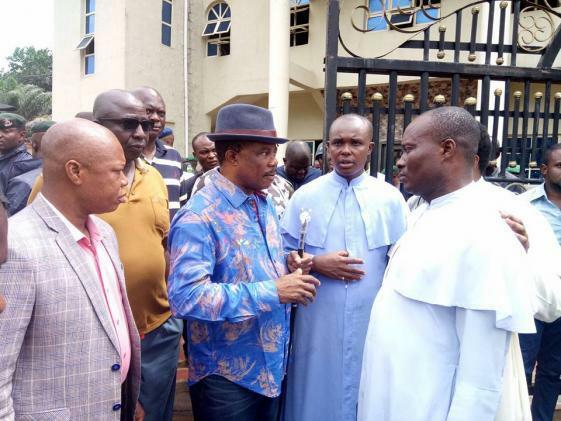 The Catholic Diocese of Nnewi, Anambra, has described Sunday’s attack on worshippers at St. Philip’s Catholic Church, Ozubulu, by a gunman as regrettable. The church, in a statement signed by Rev. Hygi Aghaulor, Director of Communications of the Diocese, and available to newsmen, said that the Parish Priest, Rev Fr. Jude Onwuaso escaped unhurt. He described the act as a sign of loss of what is sacred and consoled the families of victims of the attack. “It is regrettable that our people are more and more loosing a sense of what is sacred. “What on earth would make people open fire on innocent unarmed worshippers including children and women on a Sunday morning? “We condemn this ungodly act in its totality; we pray Almighty God to console the families affected and assure them that our hearts are with them as we pray for the quick recovery of the wounded. “For the entire parishioners, we call on them not to be discouraged in their usual practice of faith. “It is when the forces of darkness attempt to overshadow goodness that the light of God shines even brighter than ever just as it happened on Easter Sunday. “Evil may make attempts but God and goodness will always triumph; we call on the good people to continue to pray for the deceased worshippers and their families,” Aghaulor stated. Meanwhile, the Commissioner of Police in the state Mr Garba Umar, has said that the command would leave no turn unturned to bring the attackers to justice. Umar, who spoke at a news conference in Awka on Sunday, gave the updated figures of casualties as 11 dead and 18 injured. He ruled out the possibility of a terror attack, and spoke about an isolated feud between individuals in the community. He said that the command had invited some suspects who would be useful to the investigation. The CP advised residents to go about their lawful businesses, assuring them that churches and public places were safe. “At about 6.30 a.m. today, Aug. 6, I got a distress call that gunmen had invaded and shot at worshippers at St. Philips Catholic Church, Umuezekwe, Ofufe, Amakwa Village in Ozubulu, Ekwusigo Located Government Area. “As a result I, the Commissioner of Police, led my operatives immediately to the scene to rescue worshippers. “The command, under my watch, will leave no stone unturned in locating and prosecuting those behind the massacre of innocent worshippers. “The intelligence report and preliminary investigation showed that the incident was as a result of a feud between two individuals from the same community living outside Nigeria. “One of the individuals built the church where the shooting occurred; it is definitely not a terrorist attack in the mould of Boko Haram or Fulani herdsmen attack. “The command will brief the public after investigation is concluded; I commiserate with all those who lost their loved ones in this unfortunate incident. “I also encourage `ndi’ Anambra to be vigilant and to promptly report suspicious movements or strange observation of persons and actions in their localities to the security agencies.’’ Umar said.